As digital camera technology has evolved, so has the way we control our cameras. Mechanical dials have given way to buttons, menu systems and LCD displays. 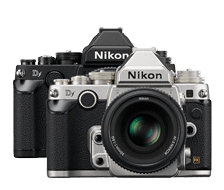 But what if we could blend the elegant, simplistic control and styling of classic Nikon film cameras like the F, F3 and FM/FE series with the advanced technology of Nikon's exceptional new D-SLRs? Enter the Nikon Df, a thrilling FX-format D-SLR with a unique mechanical operation system and classic styling along with Nikon's flagship digital camera technology. 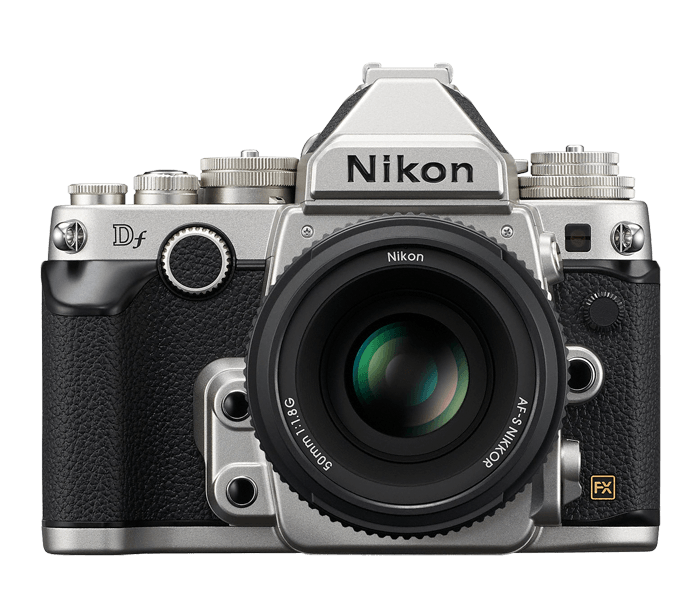 A perfect blend of classic and modern, the Nikon Df offers a more personal shooting style that will inspire a new relationship with your camera—one you may have known and lost over the years—and reawaken your joy for taking photos. The Nikon Df is designed exclusively for taking still photos, enabling high reliability, advanced functions and elegant camera control in our thinnest, lightest FX-format D-SLR. Dedicated mechanical dials for shutter speed, ISO sensitivity, exposure compensation, exposure mode and release mode let you focus on what matters—achieving your creative vision. Capture stunningly sharp, detailed images with rich, faithful colors, even in low light. The perfectly coordinated AF-S NIKKOR 50mm f/1.8G Special Edition kit lens is an outstanding companion, providing the exceptional performance of NIKKOR optics and advanced Nikon lens technology. Its manual focusing ring features the knurling/hatching of classic manual lenses for precise focus adjustments. Life is full of diverse (and often difficult) shooting situations. Many of the advancements in digital photography have enabled new levels of versatility—remarkable ISO sensitivity, breathtaking resolution, ultra-fast performance and more. 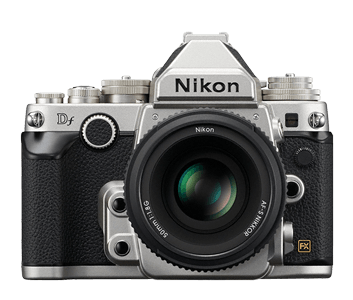 The Nikon Df is no exception. Like our flagship D4, its 16.2MP FX-format image sensor is paired with EXPEED 3 image processing for an optimal balance of resolution, image quality and shooting speed. Its wide ISO range (100–12,800 expandable down to 50 and up to 204,800) lets you capture sharp low-light subjects with crisp edges, shadow areas that reflect proper, natural tonal gradation and highlights with rich, smooth gradation. It's no surprise passionate photographers are passionate about Nikon—our engineers have invented and perfected some of the world's most important camera features. The Nikon Df continues that legacy of excellence and innovation. It incorporates our outstanding 39-point autofocus system with 9 highly accurate cross-type sensors that work all the way down to f/8. Achieve sharp focus no matter where your subject is within the frame at up to 5.5 frames per second. Quickly adjust white balance with our Spot White Balance feature. Create photos with dazzling dynamic range with built-in HDR and Active D-Lighting. Its rugged magnesium alloy body will withstand harsh conditions, and its 3.2-inch 921K-dot LCD display provides beautiful high-definition views of your shots. For over 80 years, NIKKOR lenses have been regarded as some of the finest optics available. In fact, photographers are still using NIKKOR lenses 30 or more years old! The Nikon Df wouldn't be a true classic camera if it couldn't work with those lenses, so we developed a mount system that works with all current AF-S, AF-D and AF NIKKOR lenses. Additionally, a metering coupling lever makes it possible to use both AI (Aperture Index) or non-AI lenses. Use i-TTL compatible Speedlights, the AR-3 threaded cable release, Nikon's new WR Remote System and even Nikon's exciting WU-1a Wireless Mobile Adapter for instant Wi-Fi photo sharing to your smartphone or tablet! Attach the optional WU-1a Wireless Mobile Adapter and instantly share your beautiful photos. Connect to the Nikon Df with a compatible smartphone or tablet±, then use it to browse your camera's memory card, import your favorite photos and even see what your camera sees and fire the shutter! When photo-worthy action starts, hold down the shutter button and capture every movement, expression and feeling at 5.5 frames per second, even when shooting with the LCD display in Live View mode. Stop reaching for your smartphone when an important moment happens—except to share the great shot you just caught with the Nikon Df. Whether you're using the viewfinder with its 100% frame coverage or the LCD display in Live View mode, the Nikon Df captures tack-sharp photos. Its 39-point autofocus system with 9 cross-type sensors quickly locks onto your subject, and Nikon's unique 3D-tracking uses the 2,016-pixel RGB sensor to recognize and follow it across the frame. When shooting with the LCD display in Live View mode, the Nikon Df uses fast contrast-detect AF, operating at the same speed as the flagship D4, and can display your composition at up to 19x for accurate focus confirmation—perfect for tripod shooting. The Nikon Df features exceptional metering and onboard intelligence, freeing you to focus on the composition of your shots and, most importantly, the moment that's taking place. Nikon's outstanding Scene Recognition System analyzes your shooting situation, compares it to an onboard database of thousands of scenes and automatically determines the most appropriate exposure, white balance and autofocus settings as well as i-TTL flash exposure when using a Nikon Speedlight. Built-in HDR automatically combines two photos into one highly dynamic image, and new subject-based Active D-Lighting automatically brightens shadowy areas on your subjects—great for portraits. The Nikon Df's easy to use Picture Controls let you alter your color palette and add a personal touch with six settings available; Standard, Neutral, Vivid, Monochrome, Portrait and Landscape—customize the look and feel of your photos. The Nikon Df is compatible with so many past and present NIKKOR lenses, it's easy to expand your capabilities and creativity over time by growing your own collection. AF NIKKOR lenses, including type G, E, and D lenses (some restrictions apply to PC lenses) and DX lenses, AI-P NIKKOR lenses, and non-CPU lenses. Electronic rangefinder can be used with lenses that have a maximum aperture of f/5.6 or faster (the electronic rangefinder supports the center 7 focus points with lenses that have a maximum aperture of f/8 or faster and the center 33 focus points with lenses that have a maximum aperture of f/7.1 or faster). IX NIKKOR lenses and lenses for the F3AF can not be used.